Spiceworks offers a full suite of apps that IT pros need, including inventory, network monitor, and help desk. These apps combine with a community where IT pros can connect with one another to share content, resources, troubleshoot problems, get product advice, keep up with tech trends, and even advance their careers. Spiceworks allows IT team members to easily accept tickets, reply, add private comments, and close them out. Custom fields can be used to track any data needed to solve customer issues. The Spiceworks Help Desk module allows for mobility, with native apps for iOS and Android smartphones and tablets. The mobile app allows agents to field tickets from phones or tablets, sort them, assign them to team members, respond to and close tickets, track time, and change priorities. Spiceworks also allows for setup of individual organizations and user portals that can roll up to a master help desk, so companies can work with clients and multiple locations. Spiceworks’ Inventory module includes inventory and asset management tools so you can monitor device health and get customized reporting, software tracking, and more. 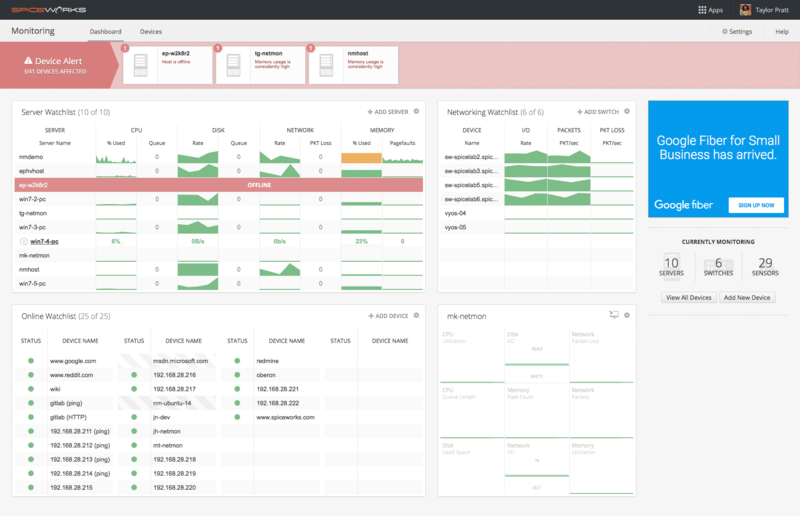 The Network Monitor module allows for 24/7 monitoring of infrastructure. From servers and switches to SNMP devices and more, IT team members are alerted at the first sign of trouble and stay on top of any issues. Not sure Spiceworks is right for your business? Use our IT software Product Selection Tool to compare other IT software solutions. Have questions? Call or email one of our unbiased Technology Advisers for a free consultation. Learn everything you need to know about Spiceworks. Our experts will reach out to you shortly.